Between three and five National Pacemakers are given to two-year college newspapers each fall at the National College Media Convention. 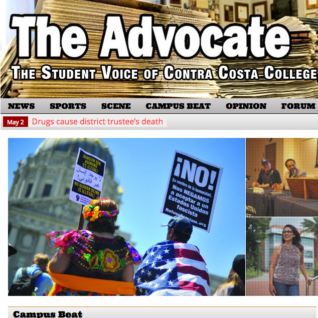 The Advocate, Contra Costa College’s student newspaper has won the National Pacemaker 15 times, most recently in 2015. The Journalism Association of Community Colleges, founded in 1955, is California’s statewide community college journalism group. JACC first began giving its Pacesetter Award in 1996. Each year, four of its member colleges receive the Pacesetter Award — a sweepstakes award given to the newspaper staff that won a General Excellence Award with the most accumulated publication and on-the-spot awards. The award is given at the annual JACC State Convention each spring. The Advocate has won the Pacesetter Award 18 times since 1996, most recently in 2015.